L, you seem to be starting to include some pro-denialist-viewpoint cartoons. Would you please try not to do that. They're obnoxious. Wich one do you think about ? The last one ? Sorry, I may not have understood that well, I'll try better...I don't have much left anyway. Yeah, the last ones on both of your last frames. In the first case, it shows a scientist essentially manipulating data (holding a lighter under a thermometer to make it hotter) and watching to see when he can push an alarm bell (to be an alarmist). Perhaps that is supposed to be some deep kind of satire, but if so I think it is running up against a version of Poe's law. The last one suggests that scientists have an appliance on their computers that asks them how they want to manipulate charts this time. If someone else has some other interpretation of these, I'd be happy to hear them, though. I had an other point of view but I agree it was ambiguous so as it is suppose to be funny, it is removed. The one with a scientist, I was seeing IPCC claiming 2°C target when we know it won't be possible to get it (At least me). I have very much enjoyed all your cartoons .. tis much better to laugh then to cry, which I will be doing any way. I like the denialist cartoons. I think it's important to keep up on what their latest thinking is, and it's funny to see how stupid they are. A classic piece from 1989. The Dodo has been found in Costa Rica...si, si ! Not a problem it is a nice one. And an other about frogs. Sorry, ASLR...too 'dark' for me. Sounds like a bumper sticker on someone's car who is about to go beat up a bunch of peaceful protesters at an environmental rally. Having been at the receiving end of that kind of hatred, I don't find their slogans particularly funny or insightful. This one basically promotes the absurd corporate lie that it is environmentalists and their ilk who are responsible for the troubles the working class face, not the vacuuming up of wealth into the top .1%'s pocket that has been so well documented by Piketty and many others. The bad guys would like nothing better than to stir up class resentment against environmentalists rather than against the real elites. And this slogan would serve their purposes very well. Please refrain from putting up similar pieces here. Thank you. wili, I guess the problem is that if you're hungry and out of work, and only have the 1% to eat, you'll quickly be hungry again. There are many more people who care about the environment. But I have to agree that the sticker isn't funny at all, as there is so much aggression hidden behind it. And maybe it doesn't help that I was so stupid to watch that horrible movie The Road a couple of months ago. But I'm sure there are funny images making fun of environmentalists of the hippie New Age type. Nice points. Yeah, I'm all for self-deprecatory humor--it's kind of my stock in trade. I haven't seen the movie. Did read the book. Good stylistically, but lots of weird gaps (how were they getting potable water all that time...). We are on track to collectively be nominated for the Darwin award. The question: who will hand it out, and who cares? If you are not paranoid you just do not have enough information yet. This must be a great comfort for... certain people. Finally, on a lighter side: where we are today regarding climate policy? Last month, the Niels Bugge Cartoon Award asked illustrators and cartoonists from around the world to submit drawings based on a basic theme: climate. "Oceans are in our hands," the contest proclaimed, urging participants from 75 countries to put forth their best (and satirical) interpretation of the singular global concern. 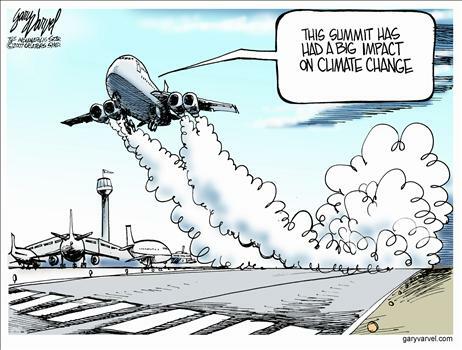 Cartoon's tool tip: The good news is that according to the latest IPCC report, if we enact aggressive emissions limits now, we could hold the warming to 2ºC. That's only HALF an ice age unit, which is probably no big deal. Great graphic. I love xkdc. But what are IAUs? That could be a bit more clearly spelled out. They seem to correspond to about 4 degrees C of global warming/cooling each. I'm just not familiar with the unit. As to "if we enact aggressive emissions limits now, we could hold the warming to 2ºC. That's only HALF an ice age unit, which is probably no big deal." "no new cars, homes, schools, factories, or electrical power plants should be built anywhere in the world, ever again unless they’re either replacements for old ones or are carbon neutral"
I'd say 'aggressive' is something of an understatement here. But what are IAUs? That could be a bit more clearly spelled out. Lets call a 4.5C difference one "Ice Age Unit." D'oh! Blind as a bat, as usual.